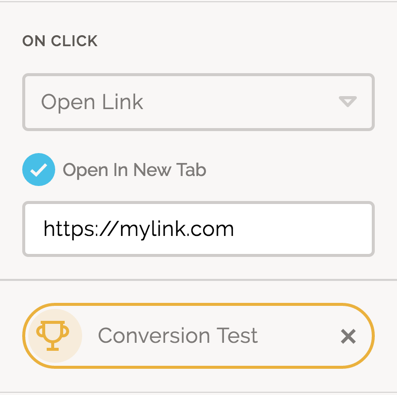 Conversion events allows you to transparently track Visitor behaviors; specifically "On Click" actions such as following a link, downloading a file, or clicking a button. Adding a conversion event will track the event as a Conversion. Landing Lion keeps track of your visitors' interactions and provides reporting data about them. The conversion event data will be displayed in the collection's Performance Report. Our conversion tracking works seamlessly for on-page actions — for example, jumping to another section on the page. ⚠️ NOTE: We cannot guarantee that data will be tracked when visitors click a link to an external page. This is because the when on-click requests are sent, the order in which they are received is arbitrary. Sometimes the conversion fires before the page redirects to the external link, but other times the page redirects first – preventing the conversion from firing. "Track As Conversion" will not be shown in the component's editor until you have set up the "On Click" event for that component. 🔑 If the conversion event you want to use has not been added to your workspace's conversion events, type in the name of the new conversion event and press enter to automatically add it to your workspace's conversion events. Edit your workspace's conversion events in your Workspace Settings. To remove a conversion event from a component click the grey X to the right of the conversion event label. You can remove a conversion event from your workspace in your Workspace's Settings.